If you live in the Netherlands and are looking for an affordable way to drive, you could consider a car sharing scheme. This ‘pay-as-you-go’ plan works out cheaper than owning your own vehicle if you are a light user and drive only 2 or 3 days a month. Let’s take a look at the main car sharing companies present in Amsterdam. Greenwheels is the major Dutch car sharing company which has been in business for over 20 years and is partnered with NS Dutch Railways and Volkswagen. Greenwheels has around 1,700 cars located at permanent parking spots in 100 Dutch towns and cities. If you walk around Amsterdam you will notice Greenwheels cars parked at various places all over the city. Greenwheels has a range of cars for use: small city cars (Volkswagen Up! ), a mid-range estate/station wagon (Volkswagen Golf Variant) and small van (Volkswagen Caddy). There are 3 Greenwheels subscription levels – Occasional (€0 per month), Regular (€10 per month) and Frequent (€25 per month). You can change subscription plan at any time. On top of this you pay hourly rental charges (€3-€6 per hour the Up!) and also a distance charge (€0.22-€0.32 per km driven in the Up!) depending on your subscription level. Greenwheels also offers day, weekend and week tariffs for longer rentals. How To Join Greenwheels: As long as you are aged 18 or over, you can join Greenwheels. This can be done online at the Greenwheels.com website where you need to upload a copy of a valid driving license and add payment details (credit card or bank account). Greenwheels requires an initial (refundable) bond payment of €225. Greenwheels rentals are managed by card – you can opt to use a special Greenwheels chip card (€25, arrives within 3 days) or add the account to an existing OV-chip card (free). As a Greenwheels member you can reserve any car in the country online or by using the Greenwheels app – as long as it’s available for the hours you want it. You pick up a car as follows – hold your card against the sensor on the windscreen (or use the app) to unlock the door. You then have to enter your special pincode in the on-board computer in the glove compartment. Take the car key out of the on-board computer and start the car as normal. Before driving off you should briefly inspect the car for any damage and compare with the written log inside. After you’re done driving return the car to the same parking spot by the specified time, put the key back into the computer and lock the car using your card or app. The scheme is quite flexible – reservations can be cancelled up to 1 hour beforehand. It’s possible to extend the rental period whilst you have the car – subject to availability – using the on-board computer. If you wish to rent during the popular weekend period then do book in advance. If you need to fill the tank (which should at least a quarter full at the end of your rental) then fuel is paid for by Greenwheels using a special bank debit card found inside the car. Those holding one of the Dutch rail discount cards get a one-time €25 driving credit. Greenwheels is a reasonable scheme for those who need occasional use of a car when public transport can’t do the job. And you won’t have to worry about running costs, insurance and residential parking fees. Note, the major car rental firms will be cheaper for longer rental periods and (unlike car share schemes) will allow you to drop the car off in a different place. Connect Car (a KAV Auto rental subsidiary) has a smaller network although a decent presence (over 300 cars) in Amsterdam. Connect Car has mainly 4 seater Smart cars although you can also find 7 seat Opel Zafiras or a Mercedes vans. Hourly prices for the Smart cars are €0.91 (0200-0700) and €3.05 (0700-0200). On top of this are distance fees of €0.26 per km (0-100km) and €0.13 per km (101km+). Connect Car does not charge a monthly fee although there is a €25 registration fee and a €100 bond required. It does charge for fuel, unlike Greenwheels. Cars can be reserved and operated using an app. 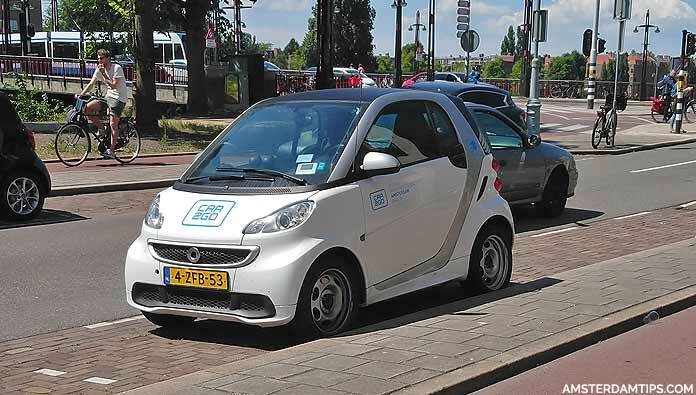 Car2Go is a subsidiary of Daimler AG and has 350 electric Smart cars (2 seater automatics) parked around Amsterdam. Car2Go runs similar schemes in other cities and has over 3 million members worldwide. Car2Go uses an app for members to locate a vehicle and start a rental. The operating Home Area for Amsterdam is 59 square kilometres (mainly within the A10 ring road) and the cars have a maximum range of 100km (+/-20km). On top of zero emissions locally, one of the benefits of Car2Go electric vehicles is that street parking in the city is free. Rental costs for Car2Go are charged at €0.31 per minute (that’s €18.60 per hour) and the car does not need to be returned to a fixed point. There are cheaper packages also available for longer rentals – €17.90 for 2 hours (50km included) and €79 for 24 hours (90km included). 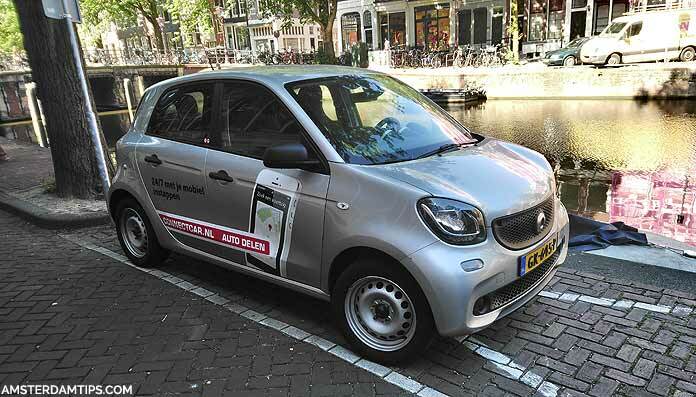 Car2Go offers a small credit if you connect the car to a charging point – of which there are currently around 4,000 charging stations around Amsterdam. Car2Go is open to individuals aged 18-89 who have held a valid driver’s license for at least 1 year.